With the emergence of multi-tools; single-purpose tools are no longer regarded sacrosanct. Although a multi-tool cannot replace the functionality of a dedicated tool, they hold an edge over them by combining the functionality of various tools. Finding your ideal multi-tool can however prove to be a hectic task especially if you are unaware of what to look for. That is why we have researched the best multi-tools, tested their functionality and then assembled the best of the best. The Leatherman surge multi-tool comes in four styles; black MOLLE Sheath, black premium nylon sheath, stainless steel/nylon sheath and the stainless steel/ premium nylon sheath. Our testers used the stainless steel with nylon sheath and Standard packaging. 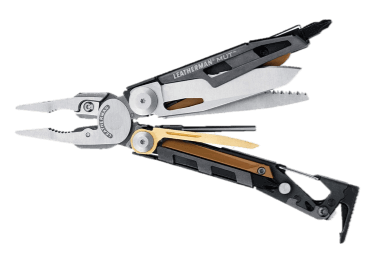 This product from Leatherman, a pioneer in general-function tools, is one of the largest multi-tools in the industry making it a worthy powerhouse. Featuring 21 different tools in one including the largest multi-tool pliers and blades, the Leatherman Surge is versatile for every need. This powerhouse sports two 420 HC stainless steel knives, one with a straight edge and the other serrated; doubling your cutting tool options. 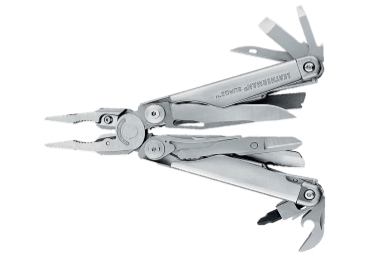 The pliers hosted by this multi-tool are the best to have been made by Leatherman. With an improvement on the distinct elliptical hub design that made its debut in 2004, its jaws are 10% larger than the standard 4-inch. Further, you will appreciate the 4.5-inch handles which give you a good grip and control over the weapon. This multi-tool also comes with a unique blade exchanger that allows you to choose between the saw blade and the file. The file it hosts is designed to function effectively either on wood or metal. It can also be removed amidst an adventure to sharpen your knife’s blade. Note that Bosch Jig Saw blades can also fit in this multi-tool increasing its versatility. Leatherman Surge’s functionality is increased by the outside opening scissors that are easy to access. Razor-sharp and big enough to cut through plastic and even carpets, this is a worthy addition. It also hosts a large Flathead that is great for prying, equally functional large bit driver, awl and replaceable 154 cm wire cutters. Because the tools (especially the knives) have high carbon content, they are handy in survival situations as they can release sparks from a fire steel. This multi-tool has 420 HC stainless steel blades. The high carbon content makes for excellent abrasion resistance and edge retention of the knives. This accounts for the blade’s durability. Just like its blades, this product’s scissors are razor-sharp. Similarly, the hard wire cutters keep their edge; their work the equivalent of dedicated wire-cutting tools. This tools has a secure locking mechanism. The 21 tools lock solidly in place, securing your safety from self-injury while at work. Listen, you need not leave that wire or drawer you are holding in order to open and work with the multi-tool. With one handed access to your tool of choice from the multi-tool, you can go about your task more conveniently. To reduce fatigue, the scissors are spring-loaded thus no need for re-adjustment. This product comes with a nylon sheath with side pockets for carriage. The unique blade exchanger, a feature that is limited to very few multi-tools, not only increases this tool’s functionality but is also very easy to use. One handed access- this is convenient as one need not interfere with their work to open the tool. Its sturdiness assures that it will not bend or break when cramped in an over-packed bag. Secure locking mechanism- Lockups are strong and easy to use. Outside-opening mechanism makes it easy to access tools such as scissors located on the outside. Stainless steel blades are easy to sharpen and resistant to corrosion. This powerhouse hosts the largest and strongest pliers. Stitching on the nylon sheath may come of easily. Interchangeable saw and file may not be ideal for users who prioritize both tools. Weighing 12.5 ounces, the tool is more on the bulky side thus not the best choice for backpacking or people who are conscious about their pack weight. So what is this tool made for? Tough jobs just like the aforementioned ones. No matter the situation, the Surge has all the tools needed to use, improvise and conquer. Note that the tools will hold to abuse as well. With one hand opening, needle nose pliers and replaceable wire cutters; this product made in the U.S is a must-have for any handyman. It scores 4.9 stars from our panel. The Victorinox Swiss Army multi-tool is available in four styles; Swisstool, Swisstool Spirit plus Ratchet, Swisstool X and the Swisstool Cs Plus. Our analysis is based on the last of the four. Our panel of analysts contend that if you are going for quality workmanship and ease of use combined with an aesthetic look then this is the tool for you. Hosting over 30 implements, this multi-tool is definitely among the most versatile multi-tools. The implements include scissors with the classic Victorinox design that is very superior and effective for cutting. It also sports Sturdy pliers and Ratchet extension that increase its functionality. This product is exceptionally well built with robust pliers that have minimal side-to-side play. With smooth edges and an excellent finish, this tool ranks highest in terms of quality. Additionally, the razor-sharp blades have great edge retention, a feature that is impressive as there is seldom need for sharpening. The stainless steel make which will not corrode easily further accounts for durability of the tool. It has a locking mechanism that bars the other implements from hurting you as you work with a particular tool. Because the tools cannot open on their own accord, your safety is assured while working with this tool. The locking mechanism also ensures that the tool will only close when released through sliding of the release button. The tools in this multi-tool open smoothly and easily, each locking into place. This multi-tool is a go-to in terms of easy access to tools; each is accessible while the tool is closed with the exception of pliers. You will appreciate how the location of the cutting tools makes it easy to cut with. The blade’s edges lay facing the insides of the tool thus when cutting, you are not working against the tool’s handles. The tools are individually held in place by springs such that you can easily access your tool of choice from the outside of the handle. That said, the spring feature which each tool has allows you to open one tool and work with it solely without the interruption of other tools. The handles are also well-rounded eliminating the possibility of cutting into your palm with added pressure. For carriage, this package comes with either a nylon sheath with Velcro closure that can be worn on the belt or a leather pouch. The CS kit comes with a cork screw, integrated to host the mini screwdriver. Being a wine-opener, this shows just how slim the chances are of you not finding the right tool within this multi-tool. Locking on the handles is such that it can be turned into a T-square. The tools are smooth and easy to open right from the box. Lock feature secures the tools. Especially appealing is the fact that you can access the tools without opening it. Bulky hence not appropriate for backpacking. With the Victorinox, every tool performs the task it was designed for. Its elegance shows just how you can own a very functional tool without compromising on beauty. This is the closest to an ideal combination of beauty and functionality. Hence it scores 4.8 out of 5 stars from our testers. The Victorinox Swiss Army Fieldmaster Pocket Knife is a combination of most essential tools added on a Swiss Army knife. It is available in three colors; the red, the red/WWP and the US Flag/ WWP. This tool features 15 different functions in one. These include Phillips screwdriver, a wire stripper, can and bottle openers. The package also sports two blades meaning you can depend on one as an extra if need arises. The large blade is perfect for removing materials while the smaller one is more suitable for detail work. It hosts scissors that are stout and will function effectively alongside an extremely sharp and great quality wood saw. Other features include an awl for drilling, hook for fishing, twisting wires and a reamer that can be used for punching belt loops. This product’s stainless steel blades are sharp, easy to sharpen and corrosion resistant. Although the tool lacks a locking mechanism, the tools snap into place firmly. The tools are easy to open right out of the box thus you need not tire with its operation. The tool-to-size ratio is another consideration that makes the Victorinox Swiss Army Fieldmaster Pocket Knife an ideal multi-tool. With a multitude of functions, it is satisfying that the tool’s weight in your pocket is barely noticeable. Its package lacks a means of carriage. However, one can easily purchase an appropriate one. Lightweight- The tool is small enough to fit comfortably in your pocket yet still big enough to give you a good comfortable grip. Location of Phillips is awkward. The blade does not lock in place meaning than one has to be extra careful while handling it. No case meaning that you will have to purchase one separately. The minimal package limits the inclusion of larger tools thus some tasks simply can’t be accomplished with this tool. If you are looking for an EDC tool, then we recommend the Victorinox Swiss Army Fieldmaster Pocket Knife as it is extremely lightweight. The combination of essential tools in a compact pack, razor-sharp blades and an aggressive saw alongside a lifetime warranty make this tool a must-have. It scores 4.5 out of 5 stars from us. Gerber Center-Drive Multi-Tool comes in four sizes: M4 Bit set, Standard Bit set and with the Bit Set not included. The product is available in these colors; black tool/black US-made sheath, black tool/ coyote brown US-made sheath, black tool/ coyote brown Molle sheath, Stainless tool/ black sheath, stainless tool/ black US-made sheath, stainless tool/ coyote brown Molle sheath and the stainless tool/ coyote brown US-made sheath. With 15 different functions that are easy to open, this product is very versatile. The implements range from needle nose pliers to a pry tool and even a fine & coarse-sided file. The 3.25-inch 420 HC blade this multi-tool hosts is 30% longer than the average knife blade included in multi-tools. This garners it significantly more cutting surface. It also hosts a full-size driver that is aligned centrally. This driver allows you to alter the center-drive bits with standard bits. This is in addition to a sharp awl that is perfect for drilling. The 420 HC blade is easy to sharpen, holds an edge and is resistant to rusting. Overall, this tool has impeccable build, quality and finish. This product has a tool lock such that the tools automatically lock in place when open. This multi-tool features one handed access to tools such as pliers, knife and screwdrivers. With easy reach to some of the most commonly used tools, accomplishing tasks becomes effortless. It comes with fabric sheath for sustenance. Innovative full-size driver on the center axis is a feature that is unique to this multi-tool. One-hand plier slide is ergonomic and deploys very smooth due to the X-Channel rail system. 30% longer blade length offers more cutting edge. Fully magnetic, replaceable standard-sized bit set. Weight is a bit on the bulky side. Carbide cutter might break easily when cutting hard wire. With this tool, you get the combination of full-sized pliers, a full-sized knife blade and a full-sized magnetic bit screw driver. The full-sized tools, locking mechanism, one-handed opening feature and innovative center-drive outshine the poor quality wire cutters of this US- made multi-tool. It earns 4.7 stars from our panel of reviewers. The Leatherman -OHT Multi-tool is available in these styles; black/ MOLLE Sheath, Black/ MOLLE brown sheath, coyote tan/ MOLLE Sheath and the Coyote tan with MOLLE Black sheath (FFP). Our review is based on the first of the four. It comes with either frustration- free or standard packaging. Frustration free-packaging, which we preferred is easy to operate as the package has no unnecessary additions. With 16 different functions, this tool is another beast with versatility. Among the integrated implements are pliers that are oriented such that they open by sliding forward rather than the conventional folding over. The 420 HC Knives it comes with, have excellent edge retention and are corrosion resistant. The 154 cm replaceable wire/ hard wire cutters hold an edge well. Stainless steel with black oxide coating also accounts for durability especially with good maintenance. This product has a locking-liner system which locks each implement into place keeping you safe and the tools secured. One-hand operating, achievable with both pliers and blades makes it convenient to use. The pliers and wire-cutters are also spring loaded so you won’t experience fatigue trying to adjust and re-adjust your grip. This feature further makes for easy opening and closing. The spring-load greatly aids the one-hand operation. Notably, the handles have visual imprints on the outline of the tool to help with quick tactile identification. This is especially handy during blackout situations. This multi-tool comes with a nylon sheath that can be mounted on a belt for carriage. This tool features a 440 stainless steel reversible strap-cutter ideal for cutting through straps, canvas alongside other fabrics. The reversible feature means that you can unscrew and rotate it to reveal a new cutting surface. It also hosts an oxygen bottle wrench alongside a cleaning rod for firearms; ideal for military use. Excellent functionality with 16 different features. One-hand operation for all tools. Easy and fast deployment of tools. Easy to use - the sliding mechanism of the pliers is smooth and very effective. Tools located on the outside thus easily accessible. No accidental sliding and injuring due to the locking liner system. Visual imprints on handles ease identification. Bulky hence not appropriate for pocket carry. The knife size is smaller than on most multi-tools. No exchangeable bit driver or file. Tools are stiff and a bit cumbersome to open at first. It requires regular opening and closing before becoming easy to control and with just enough tension felt. Poor quality sheath might need replacement. This tool is well-equipped for 16 functions including sliding pliers, spring action, and one hand operation make this a worthy tool for DIY functions. It earns a 4.7 star rating from our reviewers. The Victorinox Swiss Army Tinker Pocket Knife Tool is available in 14 colors; the American flag- Super tinker, black, black boy scout, black WWP, black cub scout, Courage WWP Design, Eagle WWP Design, Gadsden flag, Gary jargon WWP, red, red-Super tinker, Red Tinker small, red boy scout and sapphire. The choice is really yours. Hosting 12 different functions, this multi-tool only fails by not incorporating pliers which most people consider a must-have tool. Nonetheless, this tool is extremely functional with two blades, scissors that cut smoothly and reamer for scraping tasks. Durability is assured as the blades are stainless steel coated with red ABC scales. Further, they are easy to sharpen and have excellent edge retention. The blades do not lock but hold firmly in place when opened. The compact design of the tool makes it perfect for everyday use around the house and even for outdoor adventures. This multi-tool is best for pocket carry, again due to its compact size. This package comes with a toothpick which is handy for some users. Slim and extremely lightweight: this feature makes it easy to carry in a pocket and easily accessible. This product is made in Switzerland especially for users who like to travel lightly. It is the Best for EDC and earns 4.6 stars from our raters. The Leatherman – MUT Multitool is available in either the Molle Black sheath or the Molle brown sheath. It also comes either stainless steel or black with frustration-free or standard packaging. From Leatherman, a pioneer in the making of multi-tools, this product is built such that it is practical for both civilian and military use as it is geared for AR-15, M4 and M16 Platforms. This product hosts 16 different tools ranging from a bronze-carbon scraper for cleaning guns, bit drivers sized to fit and sharp scissors for medium-duty application. It also sports screwdrivers, knife and pliers for everyday tasks. This military Utility Tool primarily has the most essential firearm maintenance tools such as the firearm disassembly punch, bronze carbon scraper and bolt override tool among others. This product’s knife is sharp right out of the box and is easy to re-sharpen. Made of stainless steel, it is resistant to rust and holds an edge well. The MUT Knife locks open guaranteeing your safety while using it. One-hand operation of the tool allows you to work smoothly without interference. The pliers it hosts are also ergonomic and comfortable to use. It is convenient in that to access its pliers, you need only fold over the handles and then invert them to close. This tool further offers flexibility such that you can replace the most used parts instantly. This tool comes with a Molle sheath for carriage. The 3/8 inch wrench and Front-sight adjustment accessory are unique features hosted by this multi-tool. Ready to use as the blades come sharp right out of the box. Bolt-override tool, helpful for frequent shooters. Every tool that can wear out is replaceable. A bit bulky hence not the best for EDC. Might require oiling before its ready for operation. 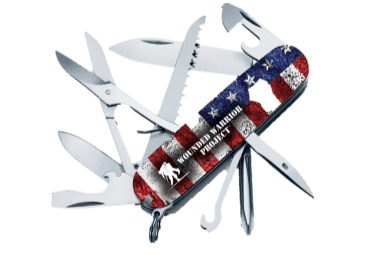 Made in U.S, this multi-tool is best for military/law enforcement as well as maintenance & repair function by civilians. With accessories designed especially for that purpose, it earns 4.5 stars from our panel. This multi-tool hosts 13 different tools including needle-nose pliers, razor-sharp 3.5 inch tanto blade, a file and wire cutters. This multi-tool hosts stainless steel blades whose edge retention and corrosion resistance are credited for its durability. This product entails a locking mechanism that secures the tools and protects you from accidental injury. Its package entails a flashlight whose light has a 160 lumen making it just bright enough to find your way in dark areas. This product has no carriage, though you can acquire one separately. Focus LED Flashlight set with CREE XB-D bulb, maximum of 150 LM lumen, covering a beam distance of 400 feet and works straight for 3 and a half hours. It also comes with 3x AAA batteries and you can use low, high or strobe light modes. It comes packaged in an aesthetic camouflage iron box for storage. Built with zoom lens allowing you to focus on minute details while working. This multi-tool, having the unique feature of a flashlight in addition to other tool essentials, earns a 4.4-star rating from our panel. This multi-tool is another best in terms of versatility as it hosts 27 different functions. These include Phillips screwdriver that is longer than most, Scissors that hold in place and successfully cuts paper and fabric, an awl that can be used for scraping owing to its semi-sharp edge and pliers which close 100% at the tip allowing you to hold thinner materials. It also features a Combo-edge serrated blade; the serrated edge on top with straight edge at the bottom. The knife is also sharp enough to perform functions of both serrated and straight edge knives. This multi-tool features high quality tools suited for everyday use. Further, its stainless steel make ensures its durability. This product has a locking mechanism that locks all tools in place once opened, keeping you safe from accidental injury. To close, one need only slide he release button. The incorporated outside opening feature of this tool ensures that you can access all tools save for the pliers without having to open the tool. Additionally, the Individual tools are held in place by strings such that you can access and comfortably use your chosen implement. This package comes with a leather belt pouch with Velcro closure for storage. Lightweight at 7.4 ounces with 27 functions. Fingerprint magnet on the handles. Because of the spring feature, there is no clamping of tools once you open one. Outside opening prompts easy one-step access to implements. The combo-serrated main blade may not be ideal for users who prefer the functions of either. With a lightweight design holding 27 robust functions accessible from outside the handles, this multi-tool made in Switzerland is a priceless addition for handymen. It scores an awesome 4.7 star-rating from us. Choosing the Best Multi-Tool: Which Factors Really Matter? A multi-tool is great at packaging a lot of handy tools into a single portable package. That much is common knowledge. So here are the questions you need to ask yourself as you scout for your ideal multi-tool. 1. Does this multi-tool have my everyday tools? The bulk of multi-tools encompass the most commonly used tools such as knives, screwdrivers and pliers. Consider whether you are using the multi-tool for personal or professional purposes. As such, this question will help you explore the array of multi-tools to determine which one hosts tools that you would need on a daily basis. While checking for your ‘must-have’ tools, consider whether they are easily accessible or not. You want a multi-tool whose tools you can easily access especially in emergency or survival situations. In addition to these crucial tools, consider whether the extra features the multi-tool has will be handy to you or whether a substitute is needed. The extra features are definitely substantial in narrowing down your multi-tools as they are mostly trade-specific. 2. Are the tools made of quality material? A multi-tool can host almost every handy tool you can think of. However, the tools are useless if they can only offer short-term service. You would rather opt for a multi-tool with less tools that are of high quality and more durable than one that hosts a plethora of tools that will wear after a while. The durability of any tool is dependent on the type of material used to make it as well as the maintenance you input. For instance, a knife with great edge retention and corrosion resistance will require little maintenance yet will survive long-term. Note the make of your multi-tool and you are well on your way to finding your ideal multi-tool. 3. How will I carry the multi-tool? If you simply cannot carry the tool easily then that defeats the purpose of a multi-tool. Weight considerations as well as the means of carriage come in here. You do not want a multi-tool that is too heavy to carry on you. An EDC tool should be of average weight to avoid it weighing you down as you go. Thus, a multi-tool that comes of average weight equipped with a means of carriage; be it a sheath or pocket clip, is a worthy one. 4. Is my safety guaranteed while working with this tool? Locking mechanisms ensure that while working with a particular tool, you are secured from injuring yourself with it. Further, when dipped in a pocket, a locking mechanism ensures that even while not working with a tool, there is no risk of any tool popping out to injure you. Note that a good multi-tool does not have to have a locking mechanism to prevent tools from accidentally hurting you. Some simply work by the tool of choice automatically being secured in place. However, a locking mechanism is always a good reassurance. Similarly, and especially for EDC tools, consider the exterior profile of a tool. The smoother the better. 5. Is the multi-tool worth its price? Lastly, compare the prices of the multi-tools to get one that is worth your money and within your budget. Remember while doing this that a more durable tool will definitely be more expensive but each penny will be worth your spending. In the same way, some tools require less spending but will encompass your essentials, all being of good quality. To put it simply, the worth is in the quality. So what would our ideal multi-tool look like? It would feature the most commonly used tools including needle-nose pliers, have a locking mechanism, one-handed access, outside opening for easy access and definitely be made of high quality material. While your ideal multi-tool may not be suitable for someone else, we recommend that you follow this guide as you scout for the ultimate multi-tool. When he's not camping or adventuring the outdoors, you'll find him grinding hard on his keyboard to put up some super-awesome content on campingmaniacs.com. Starting off on camping escapades back in 2011, he has grown fond of the activity over the years. His exposure to a myriad of different camping terrains, gear and the outdoor atmosphere has hitherto changed his perception of the entire outdoor life. He enjoys sharing the experiences of his adventures and gear reviews with the awesome camping community on this platform. Read more about us. Campingmaniacs.com is a participant in the Amazon Services LLC Associates Program, an affiliate advertising program designed to provide a means for sites to earn advertising fees by advertising and linking to Amazon.com.